From the Bestselling Author of Cod and The Basque History of the World In his fifth work of nonfiction, Mark Kurlansky turns his attention to a common household item with a long and intriguing history: salt. The only rock we eat, salt has shaped civilization from the very beginning, and its story is a glittering, often surprising part of the history of humankind. 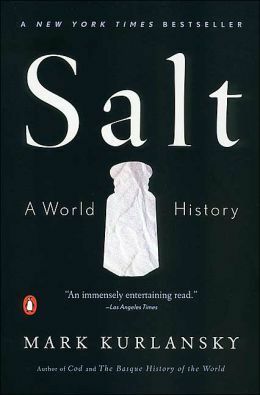 A substanc From the Bestselling Author of Cod and The Basque History of the World In his fifth work of nonfiction, Mark Kurlansky turns his attention to a common household item with a long and intriguing history: salt. The only rock we eat, salt has shaped civilization from the very beginning, and its story is a glittering, often surprising part of the history of humankind. A substance so valuable it served as currency, salt has influenced the establishment of trade routes and cities, provoked and financed wars, secured empires, and inspired revolutions. Populated by colorful characters and filled with an unending series of fascinating details, Salt by Mark Kurlansky is a supremely entertaining, multi-layered masterpiece. Mark Kurlansky is the author of many books including Cod, The Basque History of the World, 1968, and The Big Oyster. His newest book is Birdseye.